Torquay United player-manager Kevin Nicholson has hinted he will look to keep Iffy Allen beyond this season if the winger maintains his work-rate. Allen joined the National League side from Yeovil in February and has scored twice in his last three games. 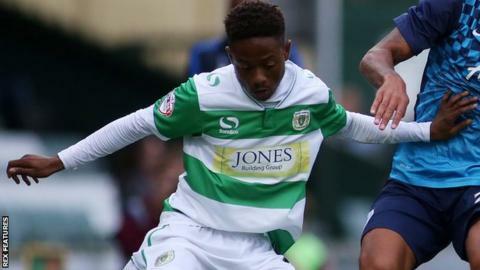 "If he can show me the attitude to sprint back in the 91st minute and make a tackle, he's definitely got a future with me," Nicholson told BBC Devon. "I'll give him some credit there because I've given him a bit of stick." The Gulls are 18th, three points clear of the relegation zone, ahead of their crunch match at home to fellow strugglers Altrincham on Tuesday. Allen, 22, had only appeared as a substitute in the league for Torquay before this month, but has started their last two games. "The other exciting stuff that he does is great, and he's had his goals and that's great, but that bit at the end is really what I'd like all my players to be all about," added Nicholson. "He needs to make sure now he can do it for a third game running, because that kind of thing goes a long way."